Appleton, WI. 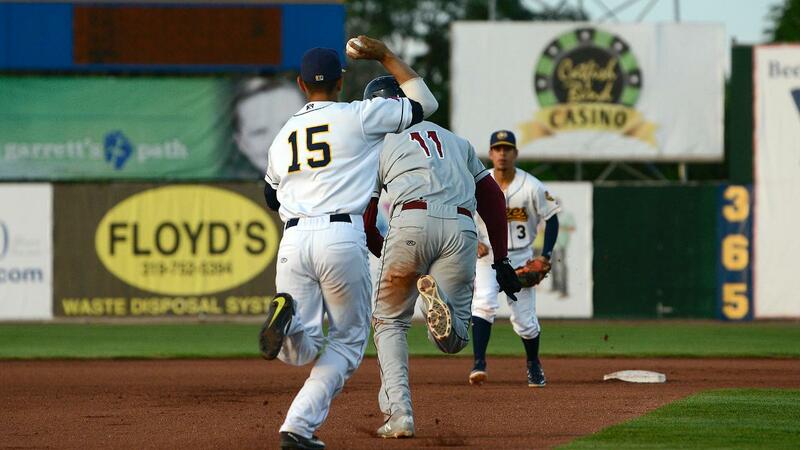 - It was another long game for the Burlington Bees (11-25,41-64), after their Wednesday game against the Wisconsin Timber Rattlers (18-20,49-58) was suspended in the bottom of the eight and didn't resume until Thursday evening. However, that didn't stop Wisconsin from taking the first game of their three game series 3-2 in ten innings. Matt Hardy (2-1) picked up his second win in his 27th appearance, pitching a shutout inning in the tenth, and also throwing a strikeout. Zack Kelly (2-3) suffered his second straight loss after allowing the game winning run on two hits in his two thirds innings. Darren Seferina got the Wisconsin offense going right away, hitting his fourth double of the year on just the third pitch of the game. Seferina advanced to third after Zach Clark flew out to right and he later scored after a sacrifice fly from Tristen Lutz to give Wisconsin a 1-0 lead. Seferina got on again in the sixth with a one out single for his second hit of the game, and advanced to second after a throwing error from Alvaro Rubalcaba at third. That set up Clark to drive in a run and he did on a single to right, giving Wisconsin a 2-0 lead. The Bees got things going their way in the seventh, after a one out walk from Tim Millard and Keinner Pina advanced him to second on his second on his second single of the game. Julio Garcia the loaded the bases on a single and Alexis Olmeda drove in his fifth and sixth RBI's in the past two games on a double to center, tying the game 2-2. Gilbert Lara started the tenth inning at second for Wisconsin, but got thrown out trying to steal third, and Kelly got Kenny Corey to ground out for the second out. Jay Feliciano gave Wisconsin life though after hitting a two out double to left for his ninth of the year. Brent Diaz then came up and walked it off on a single to center, giving Wisconsin a 3-2 victory. Michael Santos started his third game for the Bees and had another solid game, pitching five innings, allowing just one run on two hits, allowed two walks, and threw four strikeouts. In Santos three starts, he has thrown 14 innings, allowed just three runs, five walks, and 17 strikeouts. Santos has lowered his season ERA to 3.44, after having it 4.37 when he was just coming out of the bullpen. Along with Santos, the Bees got another great performance from Andrew Wantz. Wantz threw two more shutout innings while throwing four strikeouts. After allowing three runs in his Bees debut, Wantz has not allowed a run in seven appearances, has thrown 22 strikeouts, and just four walks. Orlando Martinez got a one out single in the top of the first to give the Bees their first baserunner of the game, but Kevin Williams Jr grounded into a double play to end the first. In the second, Spencer Griffin led the second inning with a single, but Millard grounded into a double play to kill the momentum in the second. The Bees totaled five one-two-three innings and had plenty of great opportunities to score in the seventh and eighth inning, but the Bees couldn't find the big hit again. With Zane Gurwitz getting moved up to high A, the Bees received a new third basemen, Tim Millard. Millard was drafted in the 35th round of the 2018 MLB draft by the Angels and had some pretty good numbers while in Orem. Millard batted .299, in 41 games, hit ten doubles, seven homeruns, drove in 29 runs, and drew 21 walks. Millard went 0-3 with a walk and a run scored in his Bees debut.